As public awareness and concern for environmental issues has increased, organizations who seek to preserve wildlife have produced advertisements and images to instill a sense of responsibility in those who see them. The image above is one such example that appeals largely to pathos by relating rainforest devastation to the destruction of Earth’s lungs. The image is mostly green and rich with life, except for the portion of the forest lung that is being destroyed in the bottom corner. This contrast draws the viewer to this portion of the image, which is also conveniently located near the organization’s logo. The placement of these items on the image is no accident, as the author used the natural path of our eyes to not only highlight the devastation that is spreading to a large portion of our forests, but to bring attention to the organization which seeks to preserve this landscape as well. The green landscape instills a since of beauty and life when a viewer looks upon it, and the section that is brown and dying appears to be almost cancerous. This contrast is a powerful metaphor into the future of the rain-forests if we continue to destroy them at our current rate. The image does a very good job conveying this, especially since there is no written text. The visual aspects provide more then enough pathos to get the viewers attention and spread the word about rainforest conservation. Finally, ethos is established by the professionalism the image exhibits and the organization logo at the bottom corner, which many will recognize as the World Wide Fund for Nature charity. The organizations past contributions and future ambitions provide more then enough credibility for a viewer to believe the statement the image is trying to make. 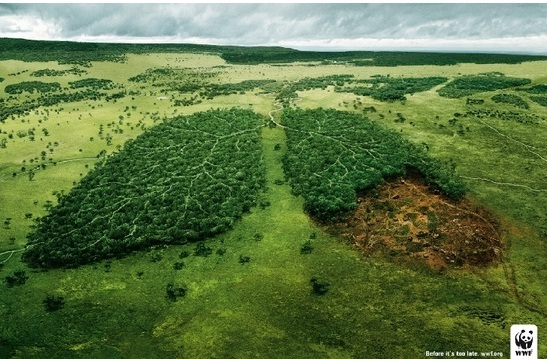 This is a really neat image, and it definitely does a lot to persuade the viewers to join their side of the portrayed argument: that destroying the rain forests is ultimately hurting the earth. I think you did a really great job at noticing the little hints that are played out by the creator of this image, especially the point you made about using our tendency to follow a line of vision to their advantage, starting with the healthy looking lung of the earth, and ending at their company’s logo. The creativity of this image by using a forest to represent a human lung and then relating it to cancer was also a brilliant idea. I really like this image. It points to something that is really important to our world right now which is a hurting environment. This image suggest that the whole world (or perhaps just the rain forests) is one organism and dying. I like how the WWF positioned everything in this awareness ad, by placing the cancerous portion of the forest right next to the WWF logo they are insuring that everyone who sees this image knows the cause without taking much space on the ad. I also really like how the image draws the viewers eyes to the words “before it’s too late”. This gives the feeling that the cancerous region is advancing and must be stopped, further supporting the WWF’s cause.